The Avengers Under Siege! event is now live! The event ends on January 19th at 3 pm PST/6 pm EST. In order to participate, players must be at Academy level 7 or higher, have built Van Dyne's, and have unlocked Wasp, Loki, Black Widow, Falcon, and Enchantress. 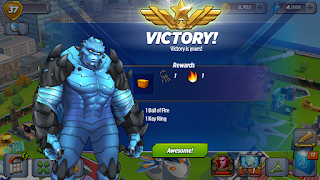 Complete the quest "Under Siege!" to start the event! Some of Marvel Avengers Academy's biggest, baddest villains have escaped, and it's up to you to defeat them! Recruit heroes from previous events and put those villains back where they belong. A new boss is available to fight every three to four days! What characters are available in the Shop? Baron Zemo, Captain Britain, A-Bomb, and Red Hulk are available in the Shop for the entirety of "Avengers Under Siege!" 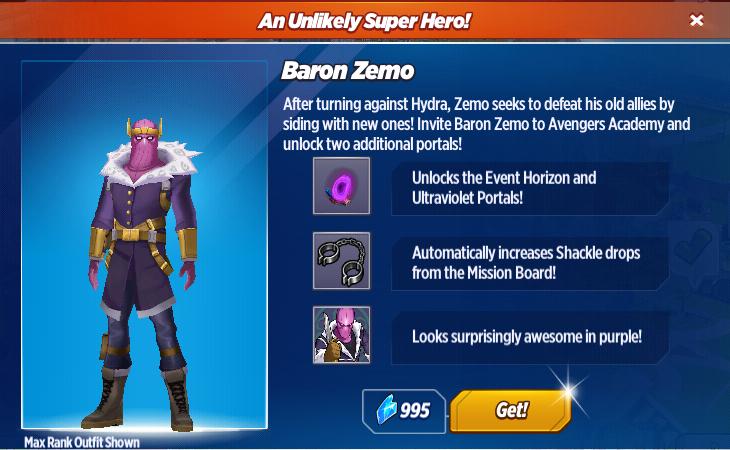 - Baron Zemo is available for 995 Shards. He unlocks Event Horizon and Ultraviolet Portals for training combat and increases Shackle drops from the Mission Board for fighting bosses! - Captain Britain is available for 650 Shards. Having him in your Academy will allow him to participate in certain boss battles! 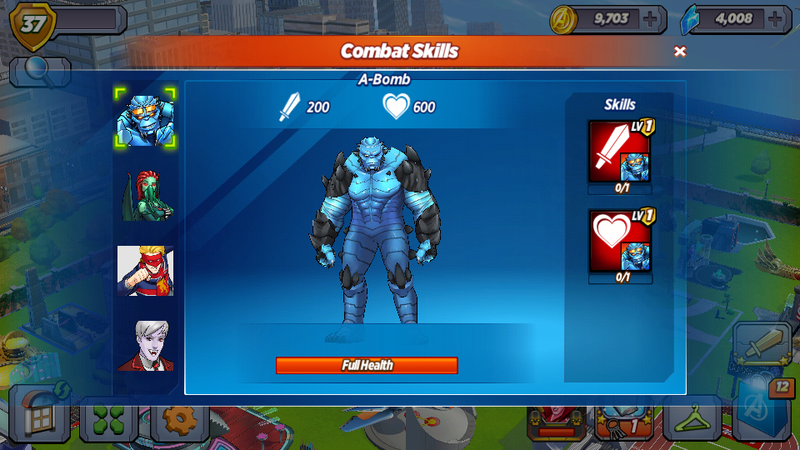 - A-Bomb is available for 650 Shards. Having him in your Academy will allow him to participate in certain boss battles! 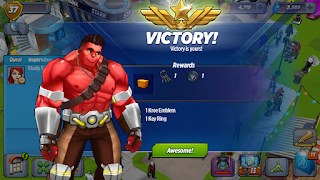 - Red Hulk is available for 650 Shards. Having him in your Academy will allow him to participate in certain boss battles! Each character comes with their own original story. 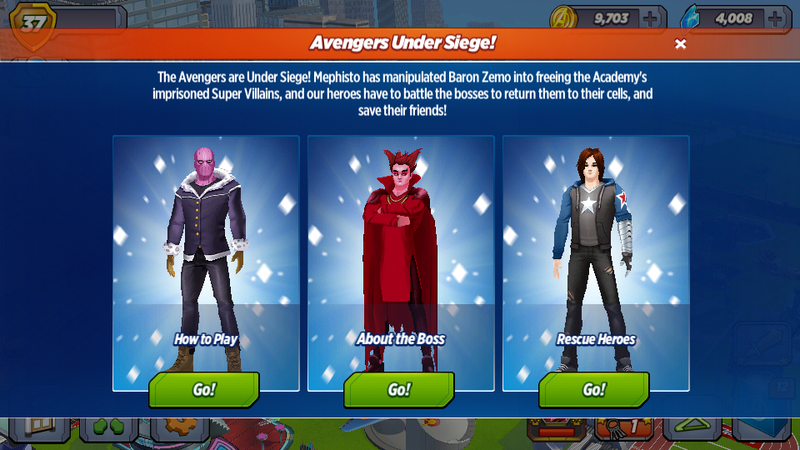 If you have already recruited one of the above characters, their bonuses will automatically be applied for "Avengers Under Siege!" You must unlock these characters by the end of "Avengers Under Siege!" or they will disappear from the game at that time. What characters are available in the Under Siege Crate? The Winter Soldier, Punisher, Jack O' Lantern, Crossbones, Electro, Green Goblin, Blade, and Groot are available in the "Under Siege!" Crate. 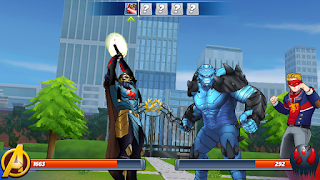 You will need 10 Key Rings from defeating bosses during "Avengers Under Siege!" to free one Super Hero. You must unlock these characters by the end "Avengers Under Siege!" or they will disappear from the game at that time. Note: Each boss only drops a maximum of 10 Key Rings. 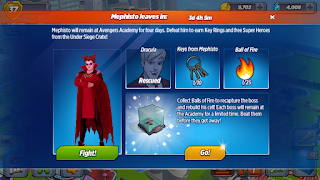 What character can I recruit by defeating Mephisto? Defeat Mephisto to recruit Dracula! Recruiting Dracula requires one Tomato Juice from Mephisto's 2nd streak. 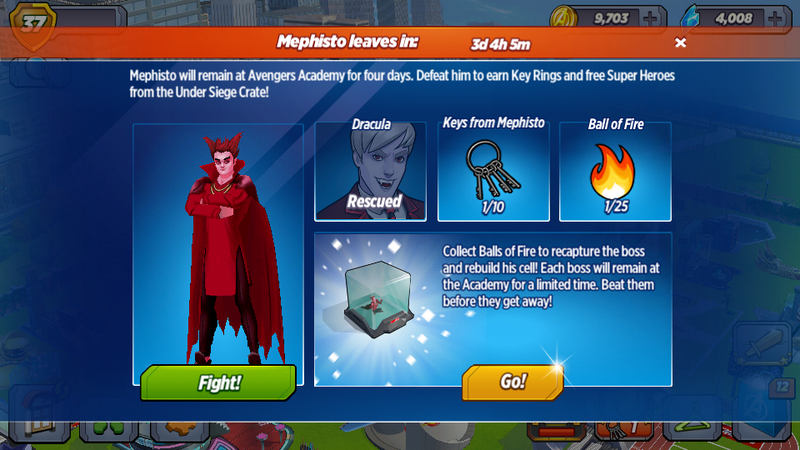 Dracula must be unlocked in the four days Mephisto is active or he will disappear from the game at that time. Once you reach the quest "Glitter Bomb!" you will be able to train combat skills. Get the Power Portal and the Vitality Portal from the Shop to start training your characters! How do I unlock Mephisto's Cell? Mephisto's Cell is available in the Shop! 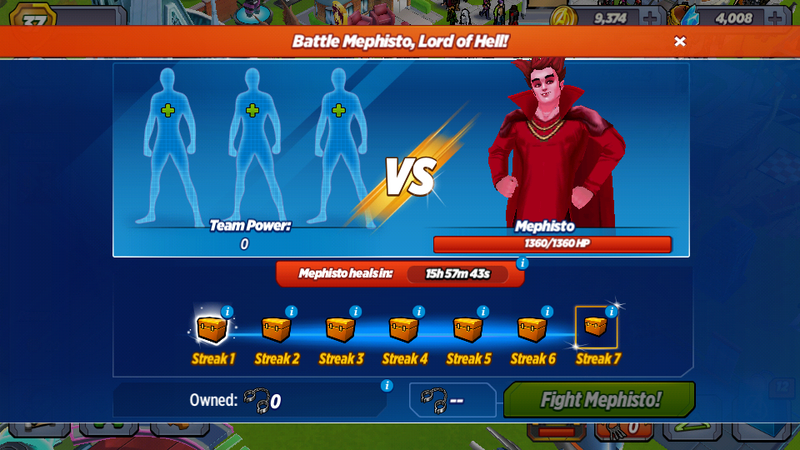 You will need 25 Balls of Fire from defeating Mephisto to imprison him. Mephisto: Obviously. They're just jealous. You're going to make them respect you. We're going to help you. Baron Zemo: Just remember our deal. I'll break you and the rest of the villains out of your cells, but you all have to work for me. Baron Zemo: You work for Baron Zemo now! We will make the Avengers show us respect! We will make them tremble in fear! 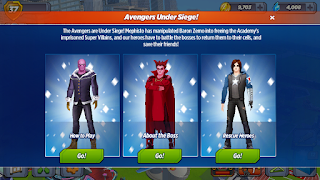 We will rule Avengers Academy! We will become the Masters of Evil! Mephisto: Fantastic speech, Zemo. I can tell you definitely didn't practice that in the mirror all morning. Carnage: Masters of Evil?! That almost makes it sound like I went to college! Yee-haw! Ronan: You've done well, masked weakling. Thanos will be pleased. Kingpin: Our first order of business should be exacting revenge on our respective enemies. Taking them hostage will give us the leverage we need to manipulate the Avengers. Red Skull: Aren't you going to free your old Hydra School classmate? Baron Zemo: You stuck my head in a toilet. Red Skull: It was just a prank, Zemo. Baron Zemo: I'm afraid of toilets now! Mephisto: You can disappear now, Baron Zemo. It's probably best if no one finds out that you're the one who unleashed Avengers Academy's most powerful villains. Mephisto: Of course you are. Why don't you lead us from inside one of these buildings? Preferably one with no windows. And be as quiet as you can. We're counting on your silent, invisible moral support. Dracula: I hope you enjoyed your time in the sun, Mephisto. It appears you're headed back to prison. Dracula: What do you mean? Mephisto: It's an evil secret. A-Bomb: We have to do everything we can to get the villains back in their cells! Dracula: Agreed. First, we should feed to ensure we have enough strength for the battles ahead. A-Bomb: I'm always ready to eat!...You aren't talking about drinking blood, right? A-Bomb: I hope you enjoyed your time in the sun, Mephisto. It appears you're headed back to prison. A-Bomb: What do you mean? Winter Soldier: We were trapped, they set us free. I was blind, but you could see. The dark is cold, and so are we. I might forget, remember me. Jack O'Lantern: Whoa! Did you write that for me? Winter Soldier: My heart wrote it for the world. Jack O'Lantern: Man! I wish I had talent like that. I only ever been good at carvin' pumkins, carvin' people, and doin' cartwheels. Winter Soldier: Come to my open mic night. Jack O'Lantern: The pumpkins ain't gonna believe this! Jack O'Lantern: You got me inspired, man! I sat down and wrote a whole dang song on the back of a dirty shirt I found. You wanna hear it?! Winter Soldier: Is it about pumpkins? Jack O'Lantern: How'd you know?! Winter Soldier: My soul is one with poetry. Jack O'Lantern: Man, you are deep as hell. This is awesome! Where do you usually hang out? Winter Soldier: Between my broken past and hopeless future. Jack O'Lantern: Me too! I'll bring some pumpkin pie! 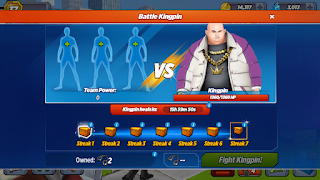 What character can I recruit by defeating Kingpin? Defeat Kingpin to recruit Union Jack! Recruiting Union Jack requires one Starstone from Kingpin's 2nd streak and 1500 credits. Union Jack must be unlocked in the three days Kingpin is active or he will disappear from the game at that time. He will be available to fight until Friday, January 13th at 3PM PST/6PM EST. How do I fight Kingpin? You will need Shackles from the Mission Board to fight Kingpin. Kingpin drops Key Rings to open the Under Siege! Crate and Baseball Bats for Kingpin's Cell. He also drops a Starstone at his second streak to recruit Union Jack. Captain Britain, Red Hulk, Union Jack, Iron Man, Loki, and Enchantress can battle Kingpin. How do I unlock Kingpin's Cell? Kingpin's Cell is available in the Shop! You will need 25 Baseball Bats from defeating Kingpin to imprison him. Baron Zemo: I think Mephisto s trying to take over the Masters of Evil. Kingpin: I can assure you that Mephisto has larger concerns than overthrowing an imaginary organization you created three days ago. Baron Zemo: Why do I feel like you guys just used me to set you free? Kingpin: I'm not in the business of discussing feelings, Baron Zemo. Now if you'll excuse me, I need to repeatedly battle the Avengers in hopes of avoiding further incarceration. Union Jack: I'd always heard you American villains were tougher. You're certainly bigger. Tougher? That's debatable. Kingpin: You've done nothing but play your predestined part in a masterful plan that's beyond your comprehension. Union Jack: That's what they all say. Union Jack: We should come up with a strategy for dealing with these escaped villains. Red Hulk: The strategy is for you to stay out of my way so I don't accidentally smash you while I'm purposefully smashing them. Red Hulk: You think I care about you or them? Go ahead and use your little spy gadgets to fight 'em yourself. Union Jack: If you're interested, I can see about getting you some spy gadgets of your own. Red Hulk: Do I look like a spy to you? Union Jack: You look like a tomato monster. Union Jack: Don't go getting all sentimental on me, you big tomato monster. Electro: Don't worry, baby! The Avengers are gonna save the day! Electro: When I'm scared or worried, I just bury my feelings in extreme hypeness! WOOOOOOOOO! Try it! Electro: That's it, baby! WOOOOOOOOO! Electro: I'm a very insecure person! Electro: Tell me what it's like being a tree, baby! I need to know! Electro: That's badass! You ever been hit by lightning?! Electro: I've been trying for the longest! Whenever there's a storm, I'm like, "Come at me, lightning! I know you're out there! Let's do this! WOOOOOOOOOOO! Electro: I know exactly what you mean! WOOOOOOOOOOO! What character can I recruit by defeating Carnage? Defeat Carnage to recruit Black Knight! Recruiting Black Knight requires one Chalice from Carnage's 2nd streak and 1500 credits. Black Knight must be unlocked in the four days Carnage is active or he will disappear from the game at that time. He will be available to fight until Monday, January 16th at 3PM PST/6PM EST. How do I fight Carnage? You will need Shackles from the Mission Board to fight Carnage. Carnage drops Key Rings to open the Under Siege! Crate and Symbiote Components for Carnage's Cell. He also drops a Chalice at his second streak to recruit Black Knight. Captain Britain, A-Bomb, Black Knight, Iron Man, Wasp, and Enchantress can battle Carnage. How do I unlock Carnage's Cell? 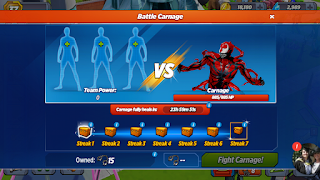 Carnage's Cell is available in the Shop! You will need 25 Symbiote Components from defeating Carnage to imprison him. Baron Zemo: Are you and the other Masters of Evil planning something behind my back? 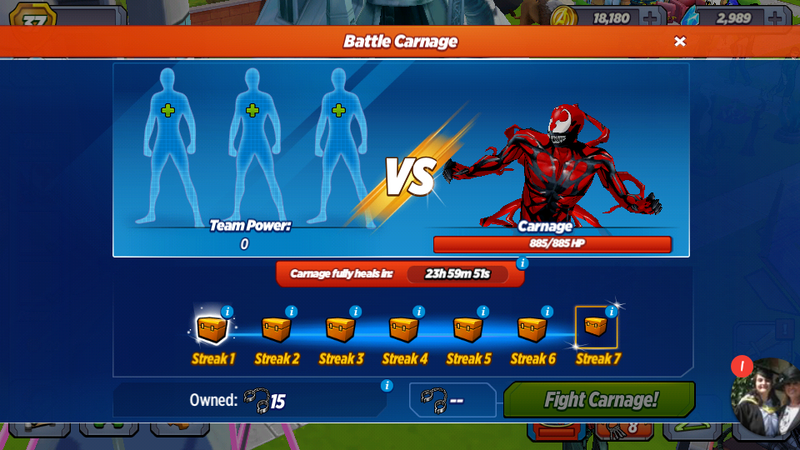 Carnage: I ain't much of a planner. My only plan at the moment is to tear apart one of these Avengers. After that, I may or may not eat said Avenger. I like to leave some wiggle room for spontaneity. Baron Zemo: If you've betrayed me, I'll destroy you all. Carnage: Shoot, I might just change my entire agenda, and kill all y'all first. That's one of the many perks of being a psychotic lunatic. Yee-hawww! Black Knight: I've spare thee for now, foul creature, but never test the Ebony Blade! Black Knight: Would you have me finish you now? Carnage: I mean, I'd certainly prefer if you didn't. I'm just sayin' if it was me, I'd kill you to be on the safe side. It's obviously the most practical and entertaining option. Black Knight: Thankfully, I'm nothing like you. Carnage: I'm a special homicidal snowflake! Yee-haww! Blade: After we beat these villains, let's fix England's vampire problem. Blade: Place is overrun with suckheads. They like the fog. We should start at Stonehenge. Keep moving to the Tower of London, Windsor Castle, and Canterbury Cathedral. 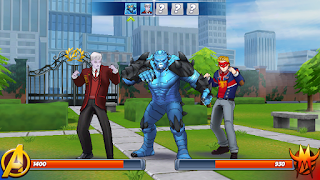 Captain Britain: Are you using vampire hunting as an excuse to go sightseeing? Blade: Let's also ride around the city on a double-decker bus. Perfect vehicle for hunting suckheads. Captain Britain: We make a good team, Blade. Together, we could help people across the globe. Captain Britain: It never hurts to have a teammate. Don't you ever get lonely? Blade: I don't get emotions. Blade: Winter Soldier's poetry transcends emotion. Green Goblin: Trick or treat! Punisher: You're a few holidays late. Green Goblin: But this uprising is the gift that keeps on giving! Zemo won't be able to control these villains. When he inevitably falls, I'll step in, and reshape their minds! Punisher: If you try it, I'll beat you over the head with your purse. Green Goblin: It's a satchel. And I don't want to use the villains for evil. I want to tell them my redemption story, and help them turn their lives around. Punisher: I'm starting to get concerned about the future of the punishing industry. Punisher: We should work together sometime. Punisher: Yeah. I'll take you to some rough neighbourhoods. You'll fly around on your little bat, cackling and throwing pumpkins, and when the bad guys come out to see what's going on, I'll pick 'em off one by one. Punisher: Freaky sideshow. Stupid distraction. Whatever works for you. 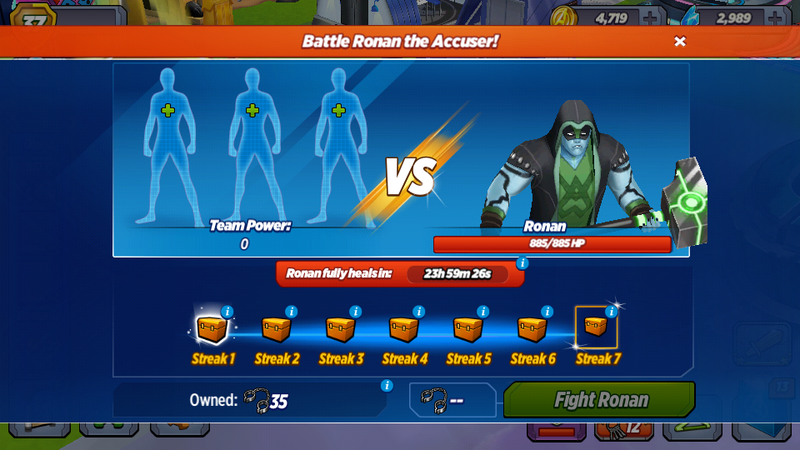 How do I fight Ronan? 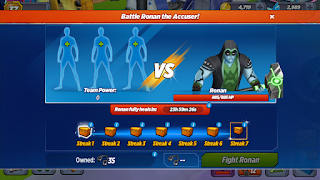 You will need Shackles from the Mission Board to fight Ronan. Ronan drops Key Rings to open the Under Siege! Crate and Kree Emblems for Ronan's Cell. 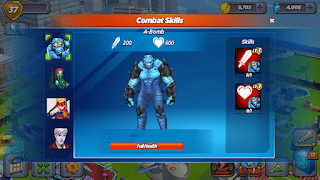 A-Bomb, Red Hulk, Loki, Black Widow, and Falcon can battle Ronan. How do I unlock Ronan's Cell? Ronan's Cell is available in the Shop! You will need 25 Kree Emblems from defeating Ronan to imprison him. Baron Zemo: You think I don't know what you're doing?! No one double-crosses Baron Zemo! My skills are unparalleled! My intellect is beyond reproach! My emotions are extremely delicate! Ronan: Did you honestly think I'd go from serving Thanos to you? Baron Zemo: I have a very high opinion of myself! Ronan: I think it's time I silenced you, weakling. I don't like your tone. Baron Zemo: Wait until you hear my shrieks of agony! Baron Zemo: Sooner or later, all must bow before Baron Zemo! Baron Zemo: Careful supervision and quiet disdain are just two of the tools in my arsenal. You'll regret the day you spurned the Masters of Evil. Baron Zemo: Tell him to never test Baron Zemo! Or is it a her? Whatever! Tell everyone that anyway! Black Knight: Fear not, fellow Avenger! The Black Knight will free thee from the clutches of villainy! Crossbones: Should I be doing something? I've never really been rescued before. Crossbones: That's it? Man, being a damsel in distress is awesome. Crossbones: You really messed this one up, Zemo. Baron Zemo: I was betrayed, and turned the tides in favor of Avengers Academy in order to save the day. Crossbones: No, your feelings got hurt, so you did something incredibly dangerous while trying to get us all killed, and when you got caught, you backtracked and did just enough to not seem like a complete jerk. Crossbones: It's hard enough for us reformed villains without you making it worse. Some people already don't think we deserve to be at Avengers Academy. You aren't helping. 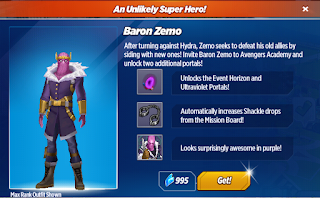 Baron Zemo: I don't need Avengers Academy. Crossbones: Maybe some of the rest of us do. Nick Fury: Follow me to my office. Baron Zemo: I can explain. I was even considering an apology. I'd also like to help rebuild the damage. Nick Fury: We're already taking care of it. You and I need to talk. Baron Zemo: Are you going to expel me from Avengers Academy? Baron Zemo: You secretly planned this whole thing?! Nick Fury: I'm always secretly planning everything. Nick Fury: To test the cells. To test my Avengers. To see what our prisoners would do if they ever escaped. Nick Fury: It was under control. My control. Baron Zemo: How do we know you aren't the one leading the Masters of Evil? Nick Fury: Do I look evil to you? What do you think of the Avengers Under Siege! event? Any particular characters you're looking forward to unlocking?